Today, I’ve gathered all the C pose boy paper dolls thus far. Guy paper dolls aren’t easy for me. I struggle with ideas for guys and I don’t think I’m great at drawing guys to begin with. They always end up looking a bit effeminate to me. In total, there are 26 C Pose boy paper doll sets. My favorites are probably the fantasy sets and you can see how much I love the look of pants tucked into boots. 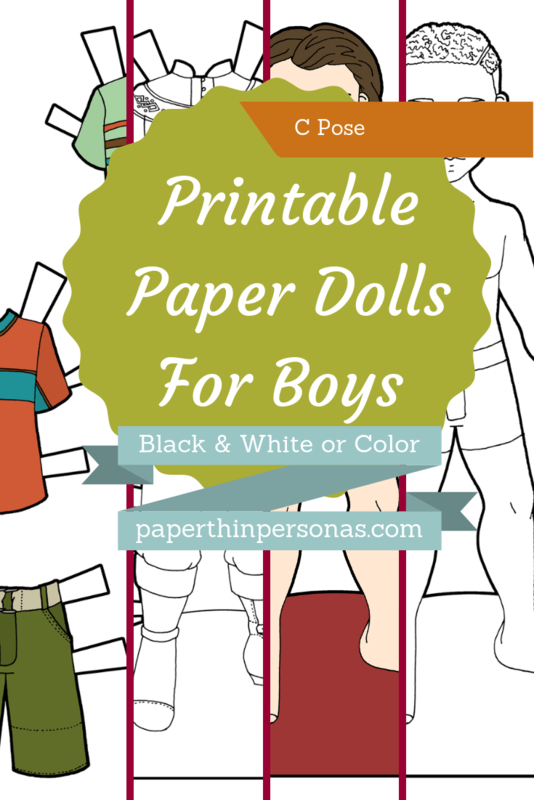 And that’s all of the guy paper dolls! Do you have a favorite? Let me know in a comment. Meanwhile consider becoming a Patron. You donations keep the blog ad free and online. Is there a theme you’d like to see for the C Pose Dandy paper dolls? I struggle with ideas for them sometimes, so do let me know with a comment. That’s a great idea. I should look into that. I keep meaning to do historical Greek and Roman and keep putting it off. Hello! Just to let you know that the link to the tuxedo outfit is wrong in this post, it is linked to the knight outfit. Thanks for your amazing work and organisation, love it! Thank you! I thought I had double checked them all, but clearly I missed one. You may need to refresh your page to see the fixed link.